This new detection method -- appearing in the journal Optica -- has the potential to provide more sensitive analysis compared with conventional NMR. Its possible utilization in higher-accuracy chemical analysis, as well as in magnetic resonance imaging -- MRI -- technology, are also of interest. NMR is a branch of spectroscopy where scientists measure the spin of an atom's nucleus in order to determine its identity. Atomic nuclei subjected to a magnetic field induce radio-frequency signals in a detector circuit. Since different atoms cause signals at different frequencies, scientists can use this information to determine the compounds contained in a sample. The most well-known application of this is in MRI-based imagining, such as CT scans. "NMR is a very powerful tool, but its measurements rely on amplification of electrical signals at radio-frequencies. That pulls in extra noise and limits the sensitivity of our measurements," explains Takeda. "So we developed an experimental NMR system from scratch, which converts radio-frequency signals into optical ones." The principle behind this 'up-convertion' is a new hybrid quantum conversion technology. The team worked to integrate this system into NMR, eventually building a device that connects electronics to mechanics, and then to optics. The material linking all three systems is an elastic membrane of silicon nitride. 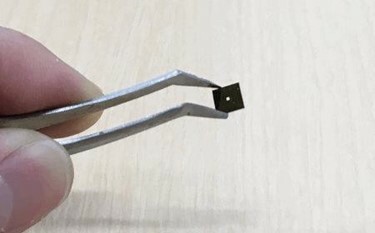 "We constructed a capacitor by vacuum-depositing a metal layer onto the silicon nitride membrane," explains co-author Usami. Using this with an inductor, they built a resonator to detect NMR signals, and next constructed an optical cavity using the metal layer as a mirror. "The incoming electric NMR signal shakes the membrane, causing motion that is detected by an optical interferometer." The team believes that the success of this optical detection can push the spectroscopy method even further, with the hope that this increased accuracy in detection and characterization of materials can be utilized in multiple scientific disciplines. Takeda concludes, "Various methods for optical NMR detection have been reported, and while some are highly sensitive, they have so far lacked widespread applicability. Our new scheme has proven to be both versatile and applicable to a wide range of materials."